The deaerator had water out the vent. Replace the deaerator vent that travels throught the original water box to a separate vent that does not travel through the water box. 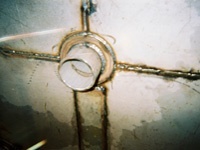 This eliminates short circuiting of the water into the vent due to poor welds and/or load failures.